EcoNow’s Waste-Eze Tabs are biodegradable, non-hazardous and are formulated for the degradation and break-down of organic solids and grease. Waste-Eze Tabs are solid, sustained release tablets utilizing patent pending SORT (Selective Oxygen Release Tab) technology, which provide active oxygen, buffers and billions of bacterial spores per gram to help clean, control odor, and keep wastewater systems running efficiently with reduced downtime. Waste-Eze Tabs can be used in pump & lift stations, septic tank systems, grease traps, ponds, lagoons, farms, car wash, lakes, ponds, boats, RVs and other waste-water treatment systems. Reduce Solid Buildup and Grease: Grease and organic solid build-up can lead to system inefficiency. Build-up on tank walls and pipes can hinder incoming wastewater flow, and cause backups and system failure. When applied regularly, Waste-Eze Tabs effectively breakdown existing grease. Hydrogen sulfide, a by-product of anaerobic degradation, is a noxious, colorless gas with an odor similar to rotten eggs, (one of the recognized odors associated with wastewater). When hydrogen sulfide is trapped in an enclosed area (force main, tank, etc.) it can form sulfuric acid, which will corrode tank walls and pipes, eventually leading to system failure. Waste-Eze Tabs prevent the creation of hydrogen sulfide. Waste-water Treatment facilities: Fats, Oils & Grease (FOG) represent a large problem for many municipalities. Improper disposal of FOG into drain and sewer lines can cause sewage to backup into basements of homes and businesses. Sewer systems, treatment facilities, lift stations, collection and wells become adversely affected. Waste-Eze solves these problems. 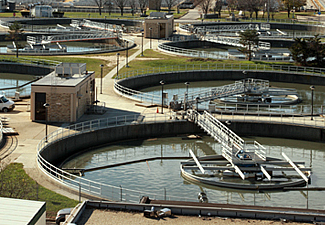 Pump and Lift Stations: During normal operation, pump and lift stations are often left with an approximate 18” level of wastewater at the bottom. This water level accumulates FOG and other organic waste solids. Being in an enclosed area with lack of oxygen, there can be a buildup of hydrogen sulfide odors. Waste-Eze Tabs treat the effluence that comes through the bottom level of water. It aerobically degrades the FOG and organic solids while preventing hydrogen sulfide odors. In effect, there is a pre-treatment of the waste being pumped to the treatment facility. Municipal Sewers: Municipal Sewers that collect sanitary sewage (as opposed to rainwater/storm water runoff only) are often faced with excess levels of wastewater that can result in hydrogen sulfide odors and accumulation of Fats, Oils & Grease (FOG) and other organic waste solids. Waste-Eze Tabs aerobically degrade the FOG and organic solids while preventing hydrogen sulfide odors. Septic Tanks: Waste-Eze Tabs for Septic Tanks will help restore the balance of beneficial bacteria in the tank to help the septic system operate properly. This oxygen enriched bacteria formula breaks down organic solids and waste. No messy powder or liquids, and is safe for all plumbing. Grease Traps and Floor Drains: Waste -Eze Tabs can be used in the food service industry for the break-down of Fats, Oils & Grease (FOG) in grease traps and floor drains. Treatment eliminates the need to manually clean and *pump grease traps of FOG resulting in significant dollar savings. Competitive enzyme products only emulsify/liquefy the grease, while Waste-Eze Tabs digest and eat grease turning it into carbon dioxide and water. Car Wash: Reclaimed water typically experiences anaerobic decomposition (reduction of oxygen), and is the main cause of equipment problems. These anaerobes cause odors, and along with increased hydrogen sulfide levels, allow build up around jets and nozzles; restrict flow in plumbing; expedite corrosion in pipes; and increase spotting during final rinse. Waste-Eze Tabs will oxygenate reclaimed water so that it dries faster; reduces spotting; and reduces hydrogen sulfide levels, thus eliminating odors, neutralizing oils and grease, and breaking down sludge. Boats and RV’s: Waste-Eze Tabs are designed to break down all organic waste, tissue material and clean and maintain the holding tank system in your boat or RV. There are no toxic chemicals or formaldehyde making it is safe to use. Ponds, Lakes, Lagoons: These are often filled with harmful algae which are an environmental issue that can have severe impact on human health, aquatic ecosystems and the economy. Algae often results in a scummy or bad smell. These waters are often filled with fertilizer, grass shavings, wood chips and farm by products. Waste-Eze Tabs provide oxygen, buffers and bacteria to attack the nutrient base, thus starving the algae so it will wither and die. The oxygenation process will help prevent and reduce odors. Waste-Eze Tabs will also lead to the aerobic degradation of FOG and organic solids. SORT: Selective Oxygen Release Tab. SORT is our revolutionary system enabling sustained, time released delivery of oxygen and active bacteria via solid tablets. Oxygen generated by the tablets also helps prevent or eliminate hydrogen sulfide and other noxious odors . Once submerged the tablets effervesce into micro fine oxygen bubbles evenly distributing the bacteria, and oxygen, while treating the bottom sediments. Unlike liquids, or powders, which are often quickly discharged due to flow through, Waste-Eze Tabs start the bottom, for more effective treatment. Our aerobic bacteria breakdown organic pollutants into carbon dioxide and water. *Over time sludge may have to be pumped in grease traps. D. Food Establishments Floor Drains – During normal course of operation, some food particles and grease can fall into the floor drains along with some water accumulations. As a result they often attract fruit flies. This often will result in significant noxious odors. Waste-Eze Mini-Tabs will clean, control the odors and aerobically break down the FOG and solid accumulations. 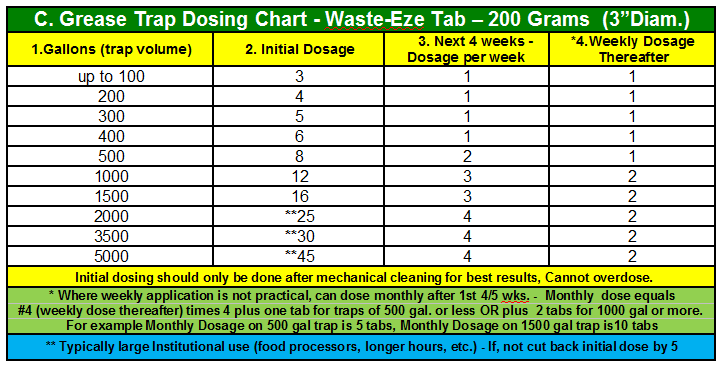 Recommended dosage is one Waste-Eze Mini-Tab per floor drain per week.